(enlarge photos to see details). 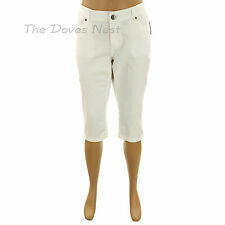 White denim capri pants. Capri Pants. Size: 14 PETITE. Zipper fly and jet tone "Sonoma" button closure. White Denim. Cuffs at bottom hem. Color: "New White", solid white with jet tone (dark gray) accents. Sonoma Ladies Capri/Peddalpushers size 14P . Condition is Pre-owned. Shipped with USPS Priority Mail Flat Rate Envelope. Size 14P (36X29). Brown Corduroy Pants. 2% spandex. 98% cotton. Fly/Zipper front. Straight cut. This is for your protection. I will be happy to work with you! EUC Sonoma Black Corduroy 5 Pocket Pants 14 Short petite slacks Super Soft! For sale is a pair of Sonoma Black Corduroy pants. Excellent used condition. Super soft! Zipper and one button closure. 29" inseam. 2 front pockets and right hip pocket. 2 pockets on the rear. 98% cotton, 2% spandex. Stretchy sateen construction. 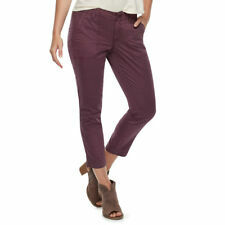 Looking stylish is easy with these ankle pants from SONOMA Goods for Life. 2 pork chop pockets. 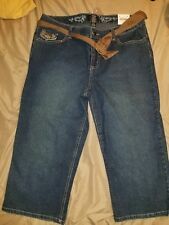 Sonoma Capris. Size 14 Petite. Cotton, spandex. 98% Cotton 2% Spandex. Machine wash.
Front Rise: 9". Inseam: 19.5". Size: 14P (14 Petite). Perfect capris your wardrobe! Tan or light beige color. Inseam (from crotch seam to end of leg): 18". Rise (from waist to crotch seam): 11". Waist (around): 34". Or you can tighten the drawstring for just the right fit.